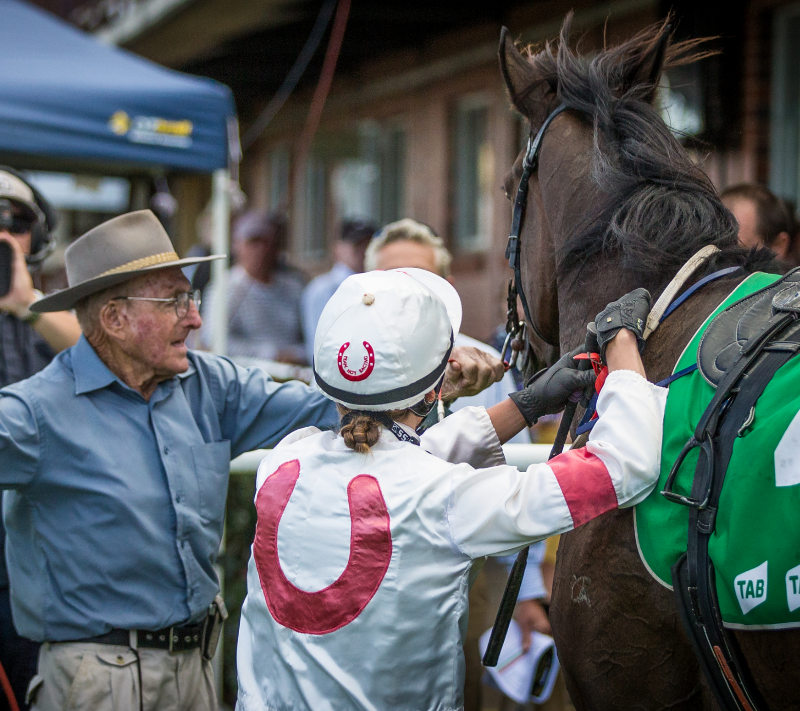 Evergreen 81-year-old trainer George Hoy is counting down the days to Saturday’s Cowra race meeting on his home turf. The spritely Octogenarian is super keen to win a race in his backyard with the only galloper he has in training, and one he terms his “best mate”. “I love training horses – it keeps me alive!” Hoy declared. The trainer predicts he will go close to winning Saturday’s Benchmark 55 Handicap over 1700m with Café Terrace. “He’s a beaut horse; I don’t know how we bought him for just $5000, he’s a bargain. We got him from a place near the New South Wales-Queensland border. Before entering the Hoy stable, Café Terrace had raced 13 times for one win and eight placings, including two placings at Doomben. “Takeover Target’s chiropractor flew to England with him and Joe (Janiak), and he has been working on this horse. He’s now based at Orange. Café Terrace’s last start Wellington (1400m) victory is testimony to that – the five-year-old jumped from the extreme outside barrier and worked hard to the lead before taken on by another horse 800m from home. Yet after shrugging off that rival, Café Terrace bounded clear to win by nearly four lengths from the short-priced favourite Harry New Shoes. “Yep, he’s going enormous and Saturday’s race has been on the radar for a while – he is bucking his brands off and will take plenty of beating,” Hoy said. Hoy, who was born on New Year’s Day, has been living in the Central Western NSW town of Cowra since 1978 after being born and raised at Peak Hill, about two hours to the north. George’s wife Dorothy passed away a couple of years ago and he has children Trevor , Jenny  and Gavin . “Jenny was born on Christmas Day and trains at Queanbeyan. I once won two races on the same day at Bungendore picnics with a horse called Princess Brother.